A section throughout the heart of an ARVC patient. 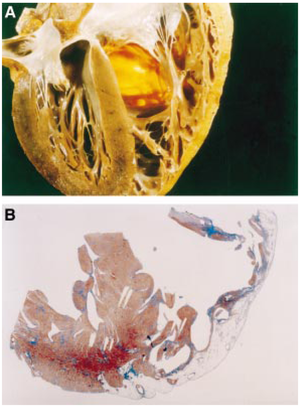 (A) Transmural fatty replacement of the right ventricular free wall. (B) Myocardial atrophy is confined to the right ventricle and substantially spares the interventricular septum as well as the left ventricular free wall. Reproduced with permission from BMJ Publishing Group Ltd.
Arrhythmogenic Right Ventricular Cardiomyopathy, (ARVC, or ARVD: Arrhythmogenic Right Ventricular Disease) is characterized by fatty replacement and fibrosis of the heart. Most commonly the right ventricle apex and outflow tract are involved. However the left ventricle can be affected too. As a result of the fatty replacement and fibrosis, ventricular arrhythmias are common in this disease and can lead to palpitations, syncope and sudden death. At more advanced ages right ventricular pump failure can occur. The diagnosis is based on major and minor criteria, as published by the European Society of Cardiology. ARVC is a progressive disease. The incidence is estimated to be 1:3.000-1:10.000. Manifestations are usually seen in teenagers. Although the diagnosis is more often made in athletes, sports are not thought to have a causative relationship with the disease. ARVD can occur in families; more than 9 different mutations have been described, most often with autosomal dominant inheritance. One unique form of ARVD, called Naxos disease (after the Greek island where it was first diagnosed), has an autosomal recessive pattern of inheritance. Diagnosis ARVC is a difficult diagnosis to make. Therefore, the European Society of Cardiology has created a list of diagnostic criteria for the diagnosis of ARVC (see table). An online calculator can help in assessing the risk in an individual patient. In 2009 these criteria were updated, see the table below. Treatment focuses on avoiding complications. Anti-arrhythmics: Sotalol better than Amiodarone. ICD implantation is recommended for the prevention of sudden cardiac death in patients with ARVC with documented sustained VT or VF who are receiving chronic optimal medical therapy. ICD implantation can be considered for the prevention of sudden cardiac death in patients with ARVC with extensive disease, including those with left ventricular involvement, 1 or more affected family member with SCD (Sudden Cardiac Death), or undiagnosed syncope when ventricular tachycardia or ventricular Fibrillation has not been excluded as the cause of syncope, who are receiving chronic optimal medical therapy, and who have reasonable expectation of survival with a good functional status for more than 1 y.
Radiofrequency ablation can be useful as adjunctive therapy in management of patients with ARVC with recurrent ventricular tachycardia, despite optimal antiarrhythmic drug therapy. On ARVD.org the latest ECG criteria for ARVD are updated. 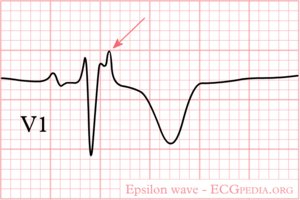 To enhance detection of ECG abnormalities specific settings to record an ARVD ECG can be used: ECG settings to enhance recording of Epsilon waves. In patients suspected to have ARVD both a normal 12 lead ECG and a Signal Averaged ECG (SAECG) are useful. PLAX indicates parasternal long-axis view; RVOT, RV outflow tract; BSA, body surface area; PSAX, parasternal short-axis view; aVF, augmented voltage unipolar left foot lead; and aVL, augmented voltage unipolar left arm lead. Diagnostic terminology for original criteria: This diagnosis is fulfilled by the presence of 2 major, or 1 major plus 2 minor criteria or 4 minor criteria from different groups. Diagnostic terminology for revised criteria: definite diagnosis: 2 major or 1 major and 2 minor criteria or 4 minor from different categories; borderline: 1 major and 1 minor or 3 minor criteria from different categories; possible: 1 major or 2 minor criteria from different categories. ∗ Hypokinesis is not included in this or subsequent definitions of RV regional wall motion abnormalities for the proposed modified criteria. † A pathogenic mutation is a DNA alteration associated with ARVC/D that alters or is expected to alter the encoded protein, is unobserved or rare in a large non–ARVC/D control population, and either alters or is predicted to alter the structure or function of the protein or has demonstrated linkage to the disease phenotype in a conclusive pedigree. E.g. : in TMEM43, DSP, PKP2, DSG2, DSC2, JUP. This page was last edited on 5 May 2013, at 13:20.